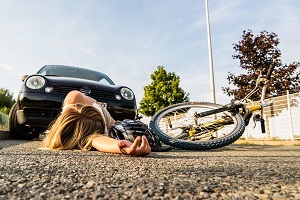 How Car Drivers Cause Bicycle Accidents | Law Office of Andrew G. Rosenberg, P.A. In recent years, more and more people are making the choice to use bicycles as a mode of transportation. Some ride for health and exercise; others want to reduce their carbon footprint; and some just ride for pleasure. As the number of cyclists on the road increases, so does the risk of serious accidents between bikes and cars. If you’re riding a bike and hit by a car, there can be devastating consequences, with injuries that take years to heal or result in a life-altering disability. Vehicles entering traffic. When a vehicle enters traffic by turning left or right onto a road from a “T” junction, a driveway, or a parking lot to the right of the bicyclist, the driver may not see the bicyclist. As the driver moves forward, it’s often impossible for the cyclist to avoid hitting the driver’s side of the car. Right turns. When bicyclists are on the right side of the road at an intersection, a driver turning right may not see the rider when attempting to turn. As the driver makes the turn, the bicyclist may hit the passenger side of the vehicle or be run off the road. Left turns. A driver turning left through traffic may fail to yield to an oncoming bicyclist the way he would for another car. Rear-end accidents. Being rear-ended at a speed that would only result in minor fender damage to a car can cause a critical injury to a bicyclist. Unlike vehicle-on-vehicle accidents, many vehicle-on-bicycle accidents do not happen at intersections. Approximately 58 percent of accidents happen elsewhere. Additionally, there is strong evidence that bicycle lanes are great protection for riders because only 4 percent of accidents happen while riders are in bicycle lanes. The time of day also factors into when vehicle-on-bicycle accident occur. Fifty-one percent of bicycle accidents happen during the day, while 45 percent happen at night. Under Florida law, a bicyclist on the road is considered a vehicle. That means bicyclists have the same rights and responsibilities that cars, trucks, motorcycles, and other vehicles have, and people who violate those rights by causing an accident can be held legally liable for any injuries. The law says that vehicles must share the road with cyclists, and drivers have the same essential duty of care to a bicyclist as they do to other drivers, with a few legal differences. For instance, Florida, like many states, now has a three-foot “safe zone” rule for bicyclists. First passed by state legislature in 2006, this law states that any vehicle attempting to pass a bicyclist must leave at least three feet of space between the rider and the vehicle. Failure to do so can result in fines or charges of reckless endangerment or even assault. When riding in a shared lane, bicyclists generally keep to the right to remain visible and allow motor vehicles to pass easily. However, bicyclists do not need to stay on the shoulder or ride in the gutter and may switch to the left side of the road if conditions require doing so for safety. Cyclists do not have to share the road if it’s too narrow to permit side-by-side traffic. If you or someone you love suffered injuries while riding a bicycle, a personal injury lawsuit may be the only way that you can fully recover financially. Many injured riders are eligible to seek compensation from the expenses related to the accident, including emergency medical treatment and long-term care needs, physical therapy and rehabilitation, and lost wages, as well as compensation for the pain and suffering. The Law Office of Andrew G. Rosenberg, P.A. is here to help bicyclists who have been injured by careless or negligent drivers start the process of financial recovery. Our experienced legal team will stand up for your legal rights and fight to get you fair compensation. Let us work on the legal side of your case, so you can stay focused on the most important thing after your injury—getting better. Contact us through our online form, and arrange to speak with a legal professional about your situation. The initial consultation is free, and we work on a contingency basis, which means we won’t charge you unless we win your case.